This is a hidden object game nowaitcomeback. Available for a while on PC, it’s now been released on DSiWare, which is apparently still a thing. For slightly less than the price of your average games magazine, you can get yourself this history flavoured puzzle game. Should you go full steam ahead and make a purchase, or does it deserve to sink without trace? Ho-ho! 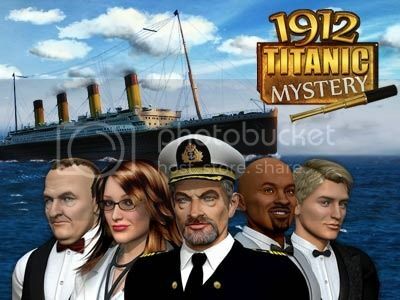 1912 Titanic Mystery is surprisingly story-heavy for a game such as this, and the premise runs thus: in the present day, the dubious decision has been made to construct a “Titanic II”, and have its maiden voyage complete the route that the original never managed. As this isn’t tempting fate quite enough, descendants of the original passengers have been tracked down and invited along for the ride. There isn’t another crash into an iceberg, though; that would be silly. No – a bomb has been hidden on board, and you’re the only one who can track down and defuse it. By tapping hundreds of random objects for no defined reason, and reading a hundred year old diary a page or two at a time. Just like James Bond. In case you’re not aware, the idea of a ‘hidden object’ game is that you’re tasked with tracking down items hidden on the screen in plain site, often obscured through clever use of colour, shading, and placement. Indeed, that’s what makes up half or more of the game. Although the areas you’re searching usually tie into the story – even if only vaguely – there’s rarely any rhyme or reason to the objects that you find there. There’s certainly surreal amusement to be had at seeing a four foot tall cheese grater on the deck of a ship, or a gigantic stamp hovering in mid-air, but it doesn’t make the task itself any more (or less) enjoyable. We found these tasks an obstruction to the rest of the content to be honest, and usually ended up tapping all over the area at random as if squishing a hundred tiny spiders (poisonous ones leaving us no other option, of course), relying on the hint button to mop up any still missing after 30 seconds or so. Tapping said hint button will show you exactly where one of these hidden objects is – but you can only carry four hint tokens at a time, with two collectable tokens on each screen – and there are about two dozen objects to find in each area. We found this to work quite well, making it impossible to progress on hints alone, while making being completely stuck in these sections highly unlikely. Heck, we actually looked for things sometimes, and were oddly pleased with ourselves when clearing a screen without resorting to hints. 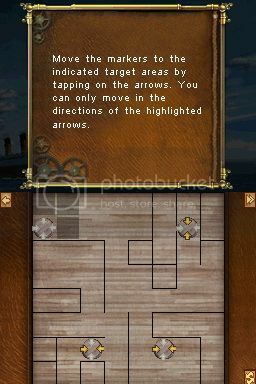 There are also actual puzzles, one at the end of each ‘chapter’. They’re usually Laytonesque tasks, and we’ll be having nightmares about the ‘move two matchsticks to make five squares into four’ one for weeks to come. There are also three frustratingly difficult spot the difference tasks, with a few anagrams thrown in for good measure. You can skip a puzzle if it proves too much for you, which is a welcome decision. Doing so adds ten minutes to your total playtime however, which is a problem if you’ve chosen to play in ‘timed’ mode (where we can only presume the ship explodes if you take too long to complete the story). At four to five hours, this isn’t an overly long experience; which is why some backgrounds and even puzzles being repeated over the course of the game made our proverbial jaws drop. Okay, so it’s clearly low budget – there’s no speech or even animation as such, just static backgrounds and talking heads – but surely there was a way to avoid such shameless repetition? QA certainly doesn’t seem to have drained the budget particularly. The English script still needs a good proof-reading in places, and one of the final diary pages is completely blank. Okay, so not all of the puzzles are particularly difficult. 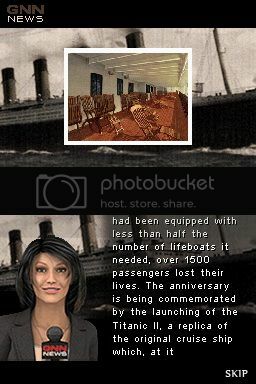 The diary, completed just before the game ends, tells the fictional tale of a lower class passenger on the original Titanic. It’s not going to win any literature awards, but holds together well (if somewhat predictably) and we didn’t feel the need to skip over any pages. Well, except the blank one, which fortunately can’t have held any important details. Another reason to read text between puzzles/junk hunts is the collection of Titanic-related facts, scattered throughout the game like chocolate chips made out of intangible knowledge instead of delicious chocolate. Unless you’ve put a lot of time into researching the ship and the tragedy that befell it, most or all of these nuggets of info will be new to you. Some are – shock, horror! – actually quite interesting. It’s not a game to blow your mind, but 1912 Titanic Mystery is good enough to hold your interest should you put the pennies in. Existing fans of the hidden object genre are sure to enjoy themselves here, and even those who have been put off by the idea previously just might make it to the end – if only through being entranced by the B-movie presentation.